While the post draw is set to take place Wednesday, May 17 at 5:00 PM EST, the starting positions for the Preakness will not factor nearly as significantly as the draw for the 20-horse Kentucky Derby. That's great news for Classic Empire, who drew the 14-hole in the Derby and was slammed from the start as horses from the auxiliary gate broke inward creating a chain reaction. 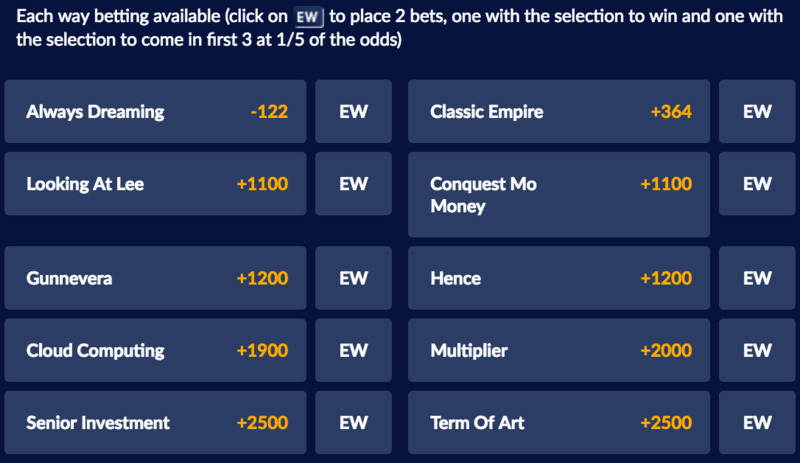 Classic Empire certainly figures to be the second betting choice behind the odds-on favorite Always Dreaming, and figures to receive a much cleaner trip this time around. Always Dreaming couldn't have been more impressive while winning the Kentucky Derby and is undefeated in four starts this year. The Todd Pletcher-trained colt has been acclimating to the Pimlico track since the Tuesday following his Derby score and continues to strike an imposing figure during morning workouts. With tactical speed and endurance to spare, Always Dreaming is the type of colt who creates his own racing luck. Many handicappers are anticipating the Preakness to be a showdown between the top two betting choices, but there's plenty of betting value underneath in the exotic wagers. Looking at Lee was ultra-impressive in the Kentucky Derby, finishing a fast-closing second despite starting from the dreaded rail position. A closer look at that race, however, reveals a very fortuitous trip for the Steve-Asmussen trainee who figures to be overbet in the Preakness. We give this colt a shot to finish third or fourth, but doubt he can outfinish Always Dreaming. Classic Empire should turn the tables on this one with better racing luck. Hence might be the more interesting of the Asmussen entries despite finishing up the track in the Kentucky Derby. Hence was likely compromised by the muddy racetrack at Churchill Downs and could return to his impressive Sunland Derby form if the track is fast. We also cannot dismiss Conquest Mo Money who ran a very game second in the Arkansas Derby behind Classic Empire. His connections opted to skip the Derby in favor of the Preakness, so this colt is well-meant for the race and will be much fresher than his primary rivals. If there's a true upsetter in this field, it's Conquest Mo Money who should be forwardly placed throughout. Traditional and conventional handicapping wisdom suggests that Pimlico is a speed-favoring strip and that the Preakness is a race that tends to support - even propel - horses with early speed. While that is certainly a debatable proposition that hasn't always held true, Always Dreaming, once again, figures to be in the catbird seat whether he is sent to the early lead by jockey John Velazquez or whether the veteran pilot chooses to sit in second as he did in the Kentucky Derby. From a pace scenario, Conquest Mo Money figures to be sent early as well and is quite capable of setting the tempo. This colt's best shot at pulling a monumental upset is likely to assume the early lead and hope that he is allowed to set comfortable splits. Conquest Mo Money seems to be a long-winded horse who will not be fazed by the mile and three sixteenths distance of the Preakness. He may be a one-paced type of runner, however, so if forced to pass horses, he will be at a disadvantage. Classic Empire should be able to secure a cozy stalking trip with jockey Julien Leparoux's patient hands keeping plenty in reserve. If Always Dreaming stays occupied with a freshened Conquest Mo Money longer than expected, Classic Empire can unleash a furious stretch rally from close range with enough in the tank to hold off closers like Hence, Gunnevera and Looking at Lee. Always Dreaming and Classic Empire are still the most talented colts in this field. While Always Dreaming deserves to be a heavy favorite, there's still a looming question about how much better Classic Empire is capable of performing.